OK….all you paper people. You know who you are! Another great find that I have to share. 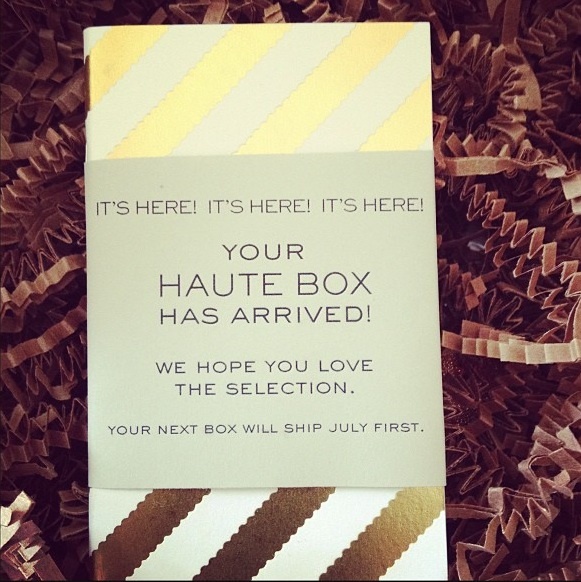 Haute Box is a surprise box of paper related goodies that comes 4 times a year. 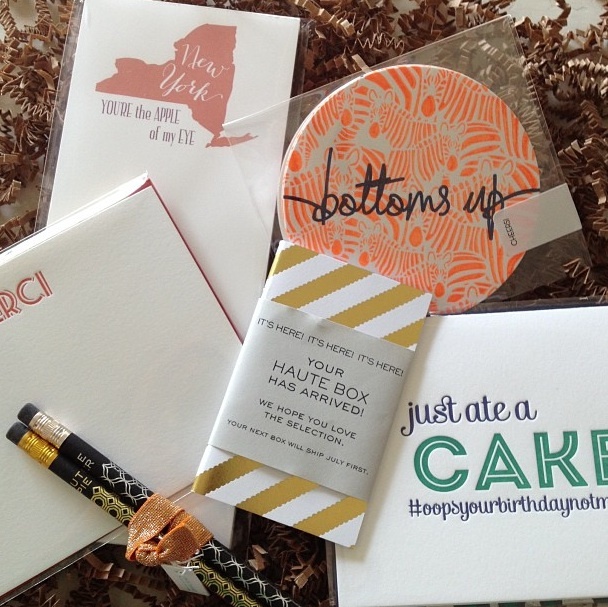 Created by the owners of Washington, D.C. based, Haute Papier, you never quite know what you’ll get. But you’ll love it! And, what a great gift for an out of town friend or relative. I’m just bummed I have to wait until July for the next one!! Do you like fun surprises? Elizabeth … how fantastic! Love it and such a great idea! Like a lucky dip! Thank-you so much for the direction of the pencils … so gorgeous and will be ordering mine tonight! I feel like I need counseling for my Paper fetish. It's out of control and ridiculous. Now it's absurd. You keep sharing such haute stuff. Isnt' it fun to get surprises? With technology I feel like the element of surprise no longer exists. Example….my son going to prom, every single girls knows every single detail of everyones dress, from color to the accessories they are wearing thanks to instagram, Facebook and taking pictures with their iPhones..crazy!! I love the element of surprise especially when it comes to beautiful things! Okay…I seriously LOVE this! You know how excited I was about Olive Box and now to find another one?! I have been collecting paper products since my high school days I just love paper. Thanks for sharing. Bring on the surprises!!! Love this! Cute Paper products get me every time! I'm always excited about a fun box in the mail! What a great idea! And I love this so much more than the makeup ones! Looks like fun! Cute loot! We do, especially if they're as pretty as these! So fun!! Like Xmas for every season! What fun this is Elizabeth! I enjoy pretty pens, pencils, and stationary. It's so personal and always fun to receive something in the mail. Its a fun and unique idea. I love the idea of giving this as a gift. Its like the gift that keeps on giving. oh i need to check them out! trace a pot-pourri of red lip comment and finding joy in orange lipstick, overhangs and not too brilliant.